Looking for the best outdoor kitchens in Scottsdale? Having an outdoor kitchen in Scottsdale is like creating an add-on to your home. It easily becomes the favorite gathering spot for friends and family. There is no limit to how much usage you will get when you add an outdoor kitchen to your Scottsdale home! Desert Environments works with you to create that perfect design that fits your budget and plans. 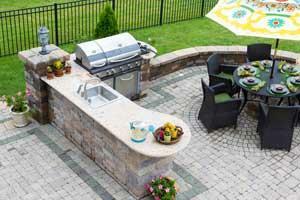 What is an outdoor kitchen? Similar to your in-home kitchen, an outdoor kitchen is a gathering and cooking place outside. Whether you want a little counter space around your barbecue and a mini-fridge, or you want to go with a more elaborate, full-functioning kitchen with dining area, shade structures, and a pizza oven—all sitting on decorative pavers—we can design and install the specific outdoor kitchen you have in mind. We offer stainless steel barbecue units and a large selection of appliances to suit any design and scale of outdoor kitchen. Create your outdoor kitchen however you'd like! You and your family will find yourself outdoors, soaking up the vitamin-D on a regular basis. Imagine having a custom barbecue complimenting your outdoor bar while taking in the big game! Or perhaps you prefer a reading space where you can unwind under a shade structure on a built-in couch while enjoying a refreshing smoothie. How about a swim-up wet bar? Do you throw a lot of parties and wish you had space for warming trays and lots of refrigerator space to keep your refreshments chilled? Done! 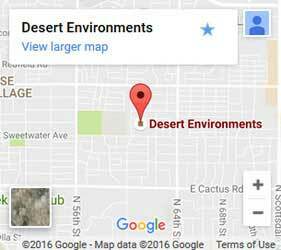 At Desert Environments, we start by listening to your needs and vision. We see this as a partnership, and we're happy to answer any questions and include you throughout the process. Have a design in mind? Tell us what you're thinking, and one of our landscape designers will draw up plans for you. Going between a few ideas? We'll show you a gallery of past client choices and see if they can give you some new ideas. We discuss everything from design preferences, from how many people you want to be able to serve to where you need outlets. We take every detail into consideration so that your outdoor kitchen has both the look and functionality you envision. 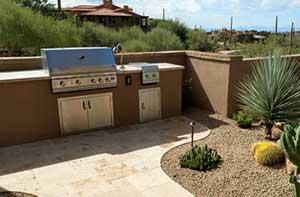 Desert Environments can blend the design of your outdoor kitchen to seamlessly fit into your landscaping. Adding touches such as fire pits, fountains, hardscaping, and more, can take your outdoor kitchen to a whole new level. Don't forget the accent lighting to make your new addition more usable in the darker hours! With over 25 years of experience and a great many gorgeous outdoor kitchens under our belts, we're able to get you the outdoor kitchen of your dreams while making the process smooth and easy for you. With proven experience, custom designs, and free estimates, you won't find anyone who can help you better!